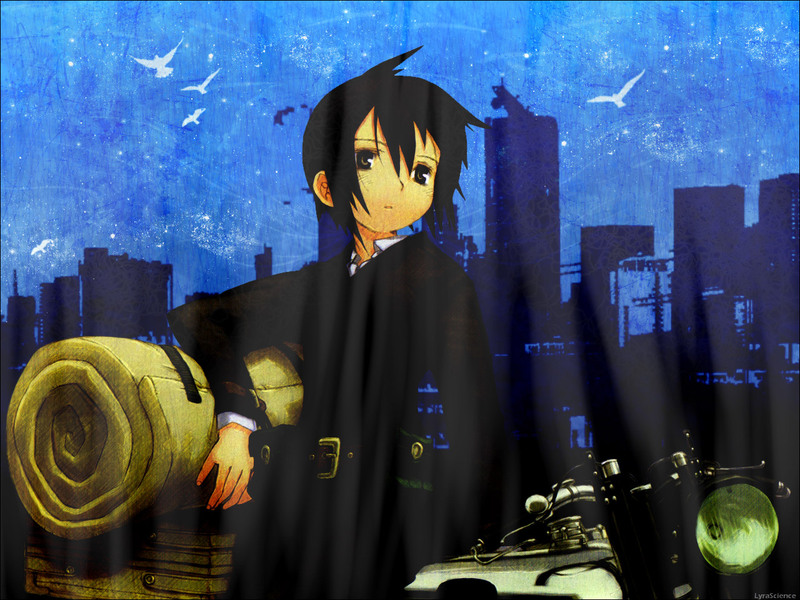 Kino no Tabi Wallpaper: Where to go next? Minitokyo »	Kino no Tabi Wallpapers » Kino no Tabi Wallpaper: Where to go next? To be honest I am not sure about the result on this one; I feel that sth is wrong but I can't find what. Nonetheless I like it a bit and and so I submit it here. I hope you like it and I would be glad to hear your comments. =D i think this would be awesome if ya took off those white things comin down. Perhaps the wall might look better without the light(?) smudges. The background is a night scene right, then that much light looks wrong. If you intended for an overhead street light effect then the light is diffused to much, and needs to be more concentrated. Those light smudges really make it look like this is a wrinkled wall hanging or something, and that's cool if that's what you were going for, because I think for a more appropriate wall they'd be really cool, but they mess up the saturation in this one, making your darks look too grey. Take away the light saturation and it's prefect.